Melt Ponds on Arctic Sea Ice (Photo Credit: Kai Boggild; distributed via imaggeo.egu.eu). This is a nonet, inspired by recent research that has provided the first quantitative evidence for the “albedo feedback” effect in the Arctic. 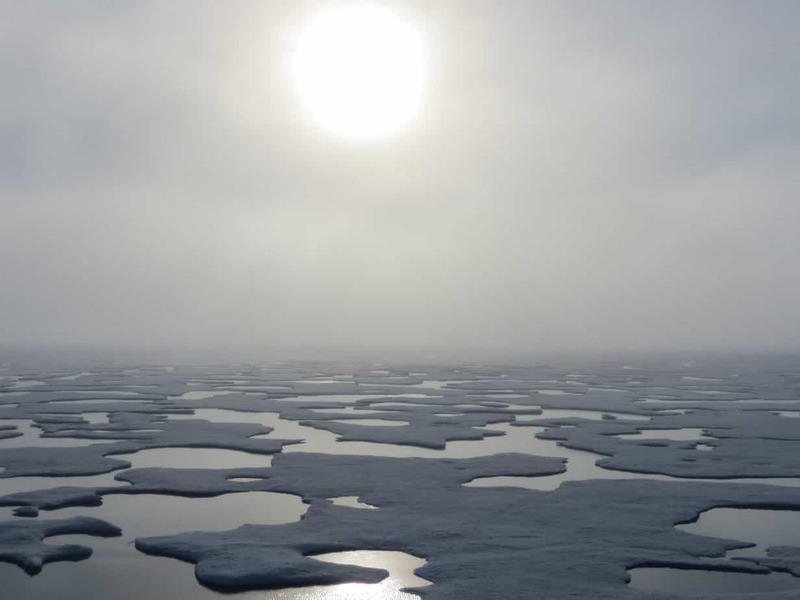 It has previously been predicted that summer ice cover in the Arctic Ocean might disappear by the year 2050, with the ice-ocean “albedo feedback” recently emerging as a potential cause for such a disaster. The albedo of a surface is a measure of how much it can reflect light, with white surfaces having a higher albedo, and hence being able to reflect more light, than dark surfaces. The albedo feedback effect occurs because as white ice (high reflection, low absorption) melts to reveal dark water (lower reflection, higher absorption) more sunlight is absorbed, thus leading to the melting of more ice. Until now quantitative evidence for the albedo feedback has been insufficient. However, by analysing satellite data from 1979 to 2014, researchers have demonstrated that this feedback effect is real. This study is the first to demonstrate that the ice-ocean albedo feedback is a primary driver of seasonal and yearly variations in Arctic sea ice retreat, and it should help us to better understand the mechanics of climate change on both a local and global scale. Another beautiful, atmospheric poem. Thank you. However, as a meteorologist, I feel the need to point out that “latent heat” in meteorology and climate physics is a technical term with a very specific meaning. It refers to the heat that is released by condensing water. Hence, water vapour stores latent heat. Light – – a sunbeam – – itself, while providing this latent heat to the atmosphere, does not carry “latent” heat. On the contrary, insolation is very real, acted-out heat. In the context of your poem, maybe referring to the visible portion of light might be an alternative option? Something like blaze, brilliance, or splendour? This could also be taken away from the dancing sunbeams and captured within the sea, couldn’t it?